The machine, located in the Animal Science Building at the College of Food, Agricultural, and Environmental Sciences, dispenses ready-to-eat bacon for just $1. COLUMBUS, Ohio -- Getting a fresh slice of bacon just got a lot easier for students at Ohio State University. The Ohio Pork Council just installed a bacon vending machine on campus just in time for finals. The machine, located in the Animal Science Building at the College of Food, Agricultural, and Environmental Sciences, dispenses ready-to-eat bacon for just $1. 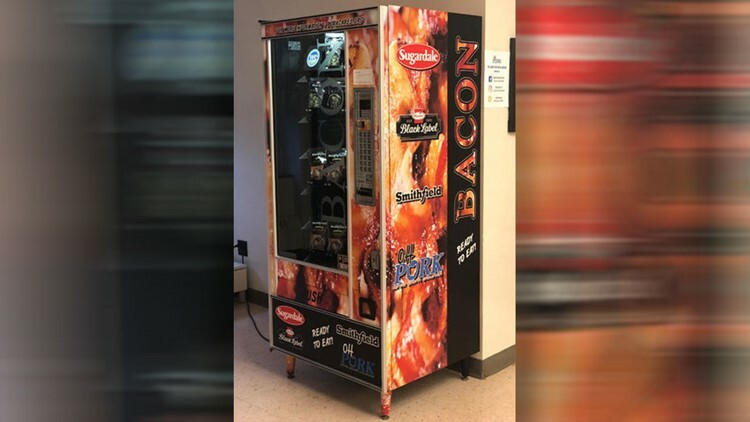 “The Bacon Vending Machine is a unique and fun way for the Ohio Pork Council to support Ohio State students and promote the pork industry at the same time,” Ohio Pork Council President-Elect Dave Shoup told CBS affiliate WBNS. If you buy bacon from the machine, you in turn help fund the university's meat science program. Hormel, Sugardale and Smithfield all donated ready-to-eat bacon to be used in the machine. There is one catch: the vending machine will only be on campus for a limited time. Students have until Dec. 13 to bring home the bacon.